Here are three ways to improve our symmetry. 1. Form straight lines with your body whenever possible (we like to call this the Lines Principle). Here our physical therapist lowers into a squat before lifting both arms (each with a 5 lbs Gravity Ball) straight out in front and then out to her side to form one straight line parallel to the ground. She's able to strengthen her lower body while simultaneously targeting both sides of her shoulders/arms and upper back in one smooth movement. Doing this will allow you to strengthen and balance the smaller ancillary muscles of the shoulders/shoulder complex [the shoulder joint and the muscles stabilizing the scapula or shoulder blade] and the finer muscles running along the outer hips and thighs which may not get regular attention. 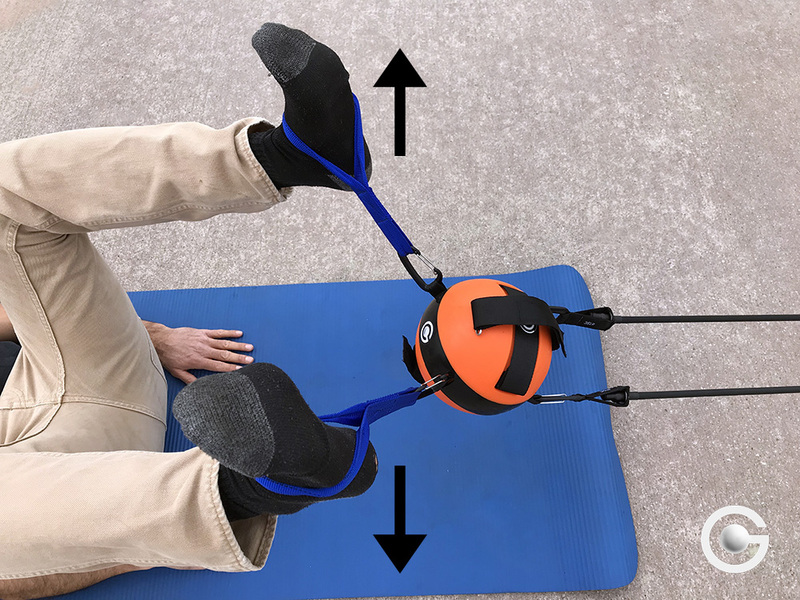 While in seated or standing position, try using both hands through the loop straps to pull away from the Gravity Ball's center. This will strengthen the lateral (outer) muscles of the shoulder, arms and forearms. When doing a floor exercise, try using both feet in the Gravity Ball's removable straps to pull away from the ball. This will strengthen the sides of your legs, thighs and hips. Remembering to practice symmetrical movements both during exercise and throughout our day to help eliminate and prevent pain, skeletal imbalances and improve mobility and strength. Choose one of these tips to try today!